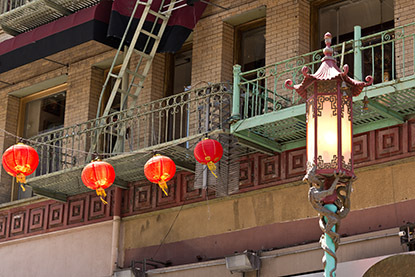 Chinatown is a must-see on any San Francisco itinerary! Drawing more visitors yearly than the Golden Gate Bridge, Chinatown offers fascinating novelty items, inexpensive and delicious Chinese food, and a variety of cultural attractions that illustrate the uniqueness of San Francisco’s Chinese community. Take a SEGWAY TOUR and discover Chinatown’s rich past! San Francisco’s Chinese history began in 1848 when the first immigrants came though the Golden Gate Straight from China and into the bay. From the start, Chinese immigrants faced harsh discrimination. Chinese children were not allowed to attend public schools and were instead restricted to Chinese-only schools. In 1870, discrimination was written into law via an ordinance that legalized housing discrimination against Chinese immigrants, and again against their employment. The trend of discrimination continued until the mid-1900s, when a series of laws allowed Chinese residents to become naturalized citizens and overturned discrimination laws. 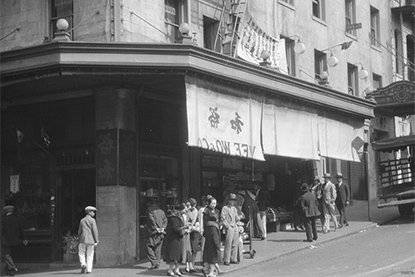 Despite the early and pervasive discrimination against those of Chinese descent, the Chinese-American community has thrived in San Francisco. 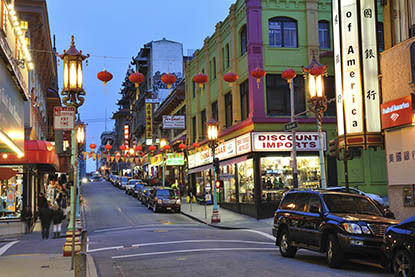 San Francisco’s Chinatown is the largest Chinese community on the West Coast and features a thriving community culture. Don’t miss the Dragon’s Gate located at the intersection of Grant Avenue and Bush Street. The gate consists of a jade-colored three-tier roof, on top of which rests two dragons facing each other. This marks the entrance to the eight-block Chinatown. Visitors can wander into novelty shops selling Buddha figurines, Chinese medicine balls, boxes containing fake chirping crickets, noise poppers, and more. Purchase tea sets, fans, incense, and other imported items from Hong Kong and China. Chinatown ends at Broadway Street, but the fun doesn’t end there! Explore beyond the boundaries of Grant Street Chinatown for an authentic experience off the beaten track. Chinatown is home to the world-famous Chinese New Year Festival and Parade, which draws thousands of spectators and caps off two weeks of festivities that celebrate the Chinese Lunar New Year. While the original parade was held in Chinatown on Grant Street, an increasing spectatorship eventually required a new route. Today’s route begins on Market Street and then goes up Geary and down Post before moving up Kearny and terminating at Columbus Street. The parade began in the 1860’s as a way to share Chinese culture with the public and has grown into the vibrant celebration we see today. The parade consists of 100 floats, hundreds of performers, firecrackers, and ends with the Golden Dragon. Made in China from bamboo and rattan, this dragon requires 100 men and women to carry it. The dragon is a truly an impressive sight, inspiring awe and delight in spectators of all ages. The authentic Chinatown spreads out from Grant Avenue and consists of Chinese language schools, temples, cultural centers, Mom ‘n Pop stores, and the largest Asian community on the West Coast. Visitors will notice elderly Chinese residents practicing Tai Chi in the park, or engaging in a game of Chinese chess that lasts for a couple of hours and draws friendly spectators. Visitors can also stop by the local Farmer’s Market. Located on Stockton Street, the Farmer’s Market is a colorful riot of produce, cuts of meat, and live animals for sale. Here, patrons haggle over the price of items, creating a loud din that is a unique experience in itself. This kind of authenticity cannot be manufactured; it is genuine and a true glimpse into the daily lives of the residents of San Francisco’s Chinatown. Interested in architecture? Visit the following buildings, which feature Chinese-inspired architecture. Sing Chong Building corner of Grant Ave and Sacramento St. Sing Fat Building corner of Grant Ave and California St.
Dragons Gate: Traditional stone archway greeting visitors to Chinatown since 1970. Grant Avenue at Bush St.
Golden Gate Fortune Cookie Factory: Take a free tour of the factory and sample fresh fortune cookies that are handmade daily. 56 Ross Alley off Jackson St.
Portsmouth Square: “Heart of Chinatown” This one-block plaza has historical markers and statues, as well as two playgrounds and a 4-story underground parking garage. Kearny St. between Clay St. and Washington St.
Union Square: This outdoor plaza offers hours of shopping, dining, and more! Located two blocks from Chinatown, visitors can sit down in Union Square for people watching, or can skip into one of the stores along the way. Westfield Shopping Centre: Located on Market Street, it boasts a multi-level complex consisting of hundreds of retail stores, specialty shops, restaurants, and more. Cable Car Museum: Just a few blocks (but some steep hills) west on Mason Street.